Creighton Block Gallery. 126 Wallace Street, Virginia City, MT 59755. Phone: 406-843-5256. The "Frontier House" Museum and Exhibit. PO Box 338, Virginia City, MT 59755. Phone: 406-843-5247; Fax: 406-843-5468. The museum features artifacts used in filming "The Frontier House", a three-part series of exploration of life on the 1883 Montana frontier. The crew and cast of "Frontier House" spent most of 2001 in Montana filming the series in which three modern day families time-travel back to live as they would have on the 1883 Rocky Mountain frontier. PBS Frontier House. A PBS production in six 1-hour segments which premiered April 29, 2002 followed three families experiencing life in 1883, enduring hunger, fatigue, blistering heat, a June blizzard, and more. Frontier House: 21st-century Americans try homesteading like 1800s pioneers. A September 10, 2001 preview of the PBS television production published in Current, a biweekly newspaper that covers public broadcasting. Virginia City Players. PO Box 81, Virginia City, MT 59755. Toll-free: 1-800-829-2969. The Opera House in historic Virginia City, Montana, established in 1949, is the oldest continuous summer theatre in the Northwest. 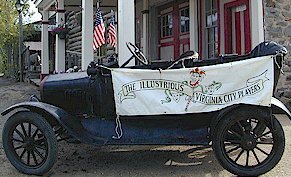 The Virginia City Players perform nightly (with exception of Monday) mid-June through Labor Day. Performances consist of a turn of the century style Melodrama followed by a Varied Vigorous Vagary of Vivacious Variety Acts, otherwise known as Vaudeville!